Blue Ribbon Taxi Auto Accident Attorney – Chicago, IL – Injured In a Blue Ribbon Taxi? Were you injured in a Blue Ribbon Taxi auto accident in Chicago and need an attorney? Our team is here to help you get the compensation you deserve. Blue Ribbon Taxi Company has served the city of Chicago and its surrounding suburbs since 1993, operating 24 hours a day, seven days a week. The company offers professional training and ensures that its vehicles are well maintained for safety on the road. Of course, that doesn’t mean that every driver lives up to the standard the company has set for itself. In 2016, a pedestrian reported in a Yelp review that a Blue Ribbon Taxi almost ran a red light after coming close to running over both him and a school crossing guard after yelling profanities about pedestrians in the crosswalk and throwing liquid from his cup and spitting the contents in his mouth on the crossing guard and the pedestrian. While the review may or may not be true – some reviews on Yelp could be filed by disgruntled former employers or passengers that miss a flight due to a late taxi or rush-hour traffic – it reflects the challenges that come with sharing a road with a taxi, as well as the potential for an auto accident. Were You Injured by a Blue Ribbon Taxi Accident in Chicago? You Were Injured In a Blue Ribbon Taxi Cab Crash. What Should You Do? New York City cabs are notorious for ruling the road, and other cities such as Chicago may not be much different, despite having only one-third of the population of the Big Apple. According to estimates, there are about 7,000 on the streets of Chicago on any given day, about 1,000 of them Blue Ribbon Taxis. Drivers are forced to navigate not only aggressive traffic but also stressed passengers, often leaving from or headed to O’Hare International Airport, eager to quickly reach their destination. Like any other method of transportation, there is always a risk factor when you get into a cab, and given the fast-paced traffic is known in Chicago, there is a real potential for injury if you are involved in an auto accident. In 2014, the Cook County Record reported that a Chicago man had filed suit against Blue Ribbon Taxi after a 2012 incident during which he was struck while crossing Michigan Avenue, sustaining injuries. According to the man filing suit, the driver of the taxi was traveling at high rates of speed in a vehicle with defective brakes, failing to either slow down or prevent hitting him while he was crossing the street. White said he sustained severe internal and external injuries in the car crash and was seeking a settlement to cover the addition costs of medical care associated with his injuries. Driver fatigue. In order to make a living, drivers may work as many as 12 to 17 hours per day, potentially leading to fatigue so severe that they can fall asleep at the wheel. Speeding. Taxi drivers are notorious for speeding – getting passengers to their destinations on time is the main goal of a taxi driver – but reckless driving as they weave in and out of traffic to get their fares to appointments or the airport on time are also common problems for taxi drivers. Inadequate vehicle maintenance. While Blue Ribbon Taxi says its cabs are well-maintained, when vehicles are on the road 24 hours a day, 365 days a week, it could be difficult to find time to properly maintain them, so it is possible that the brakes on the Blue Ribbon Taxi were defective and failed to slow the cab at it approached the pedestrian crossing Michigan Avenue in 2012. Distractions. Everything from cell phones to drunk or disorderly passengers can cause a driver to become distracted, leading to an accident. In 1994, a confused 19-year-old passenger flung herself from her Blue Ribbon Taxi en route to her destination and was subsequently killed after being struck by at least three passing motorists. The driver of the Blue Ribbon Taxi who watched his young passenger die could have easily panicked and caused a car crash. Instead, however, he drove to a nearby service station to call authorities before returning to the scene of the accident. While taxi drivers and their vehicles are licensed and regulated by both the state of Illinois and the city of Chicago, and both drivers and cab owners are required to carry certain levels of insurance, the process of collecting compensation to cover health care costs associated with an accident can be complex and confusing. Just as with any other type of car accident, if the injuries you’ve sustained in a cab accident were caused by someone else’s negligence, it’s important that the responsible party be held liable in order for you to receive a fair settlement that covers all the costs associated with your injuries, including mental health in response to potential post-traumatic stress disorder following the incident. When they pick up a fare, taxis have a responsibility to keep passengers safe throughout the duration of their journey. If a taxi driver is negligent, however, and causes a car accident that results in injuries, that driver and his or her insurance company can be sued for compensation. If the accident was the result of improperly maintained equipment or driver fatigue from long shifts spent behind the while, the cab company could be held liable for any expenses related to an injury. Because the legalities are complicated, it’s important to have an attorney on your side who is experienced in handling the laws the govern car accident fault, insurance, and compensation under laws that are specifically written for cab drivers, cab owners, and cab companies. Accidents are complicated, especially so because evidence disappears quickly, especially on busy Chicago roadways where a closed lane can be dangerous for heavy traffic that is diverted away from the accident, and witnesses often melt back into the crowd. Having a personal injury attorney who has courtroom experience handling auto accidents, especially those made more complicated by the dual insurance policies of public transportation, will ensure that you’ll be in good hands should your case go to trial. 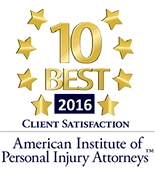 If you or a loved one were injured in a Blue Ribbon Taxi in Chicago or the Chicagoland Area, we can help. 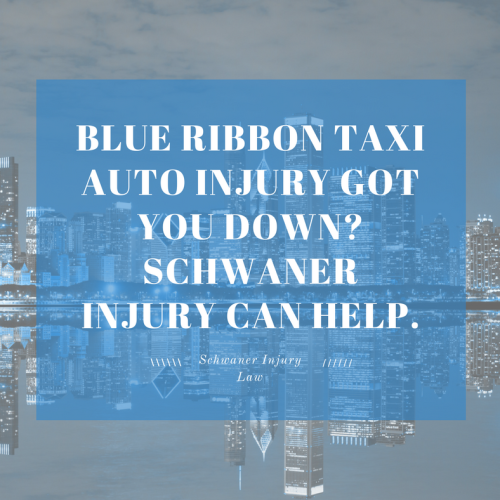 https://schwanerinjury.com/wp-content/uploads/2017/04/blue-ribbon-taxi-injury-chicago-il.png 788 940 admin https://schwanerinjury.com/wp-content/uploads/2016/04/Logo-837x321.png admin2017-04-13 12:14:132019-01-26 10:27:47Blue Ribbon Taxi Auto Accident Attorney - Chicago, IL - Injured In a Blue Ribbon Taxi?